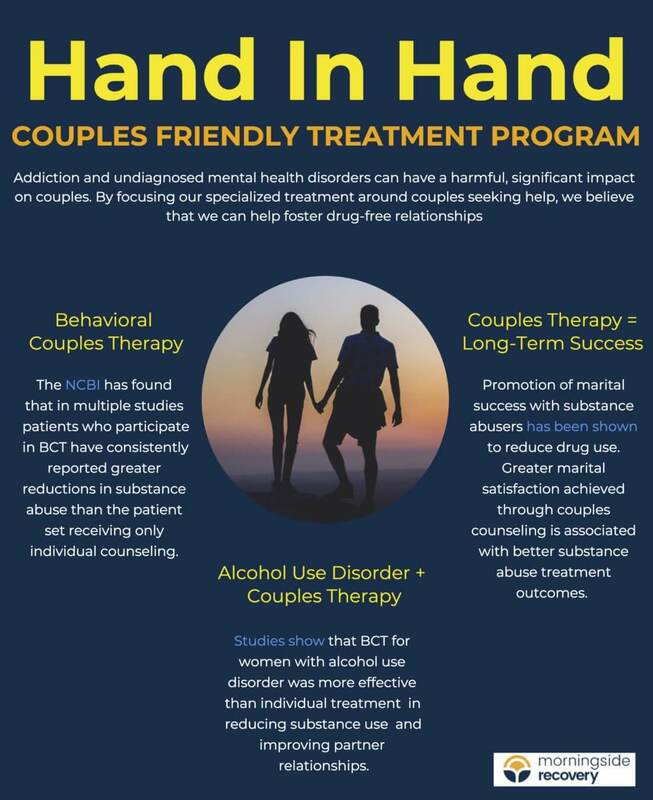 When it comes to treating Substance Use Disorder and Alcohol Use Disorder in couples, studies are showing that Behavioral Couples Therapy is more effective than Individual Behavioral Therapy. The NCBI has found that in multiple studies patients who participate in BCT have consistently reported greater reductions in substance abuse than the patient set receiving only individual counseling. Promotion of marital success with substance abusers has been shown to reduce drug use. Research showing greater marital satisfaction achieved through couples counseling is associated with better substance abuse treatment outcomes for longterm sobriety. What happens in behavioral couples therapy? When people participate in behavioral couples therapy as part of an addiction treatment program, it’s typically to overcome the strains caused by substance abuse. Substance abuse can have a number of effects not just on a person, but also on the relationship as a whole. For the individual, substance abuse and addiction can cause physical, emotional, financial, and social problems. These can all have an effect on the user’s partner. When someone you love suffers from substance addiction, you watch them transform into someone you no longer know. They may struggle with their physical and mental health, causing them to lash out or be secretive. They may also struggle to fulfill roles of obligation, such as at work or as a parent, and may begin forgetting or ignoring important family matters. Additionally, the financial strain caused by addiction can weigh heavily on a family and make it difficult for them to support themselves. In behavioral couples therapy, couples work through these problems to understand their sources. Addiction ties itself into every part of a person’s life, so there’s likely other problems within the relationship that addiction has latched onto. Behavioral couples therapy will teach couples ways to communicate and work through their problems so that neither of them has to turn to unhealthy coping methods. Morningside Recovery utilizes a dual-diagnosis treatment approach. Dual-diagnosis, sometimes labeled co-occurring, means addressing addiction along with any underlying mental health disorders that may co-exist. It is common for those suffering from addiction to also have problems in the mental health spectrum. Our Couples Treatment program is a specialized addiction detoxification and inpatient program created to help couples overcome their addiction via an innovative mix of individualized therapy, couples counseling and the choice of several unique treatment options at our state-of-the-art detox and inpatient facility in Orange County, CA. As the Nation’s first couples addiction program, we are at the forefront of offering evolving, evidence-based practices placing a strong emphasis on finding lasting solutions for our clients. You don’t have to let addiction destroy your relationship with your significant other. Help is out there. If you have questions about our program, we’d love to chat more. Reach out and let us know how we can help by calling 855-631-2135. PreviousWe’re Hiring National Business Development Reps!